During last offseason, Major League Baseball wanted to implement a rule that would prevent home-plate collisions. The rule would be simple and straightforward. The catcher is not allowed to block the plate. The runner is not allowed to blow up the catcher. The only time home-plate collisions would happen was when the flight of the ball drew the catcher into the runner’s path, making any collision accidental and unavoidable. So MLB waffled a bit, adding a line into the new rule that catchers could still block the plate, if they had possession of the ball. And a can of worms was opened. Given that sliver of light, old-school managers did not worry about teaching their catchers about where best to position themselves to be in compliance with the new rule. They simply told their catchers to play the position as they have always played it, and make MLB rule that they were doing it incorrectly. In the first half of the season, MLB gave catchers the benefit of the doubt. The onus was on the runner to avoid contact. Catchers kept blocking the plate like they always had. But then runners started to complain. Was there a new rule or wasn’t there one? And MLB started to listen. So after the All-Star break, we started to see a swing in how these plays were being ruled on replay. If the catcher was in the runners path without the ball and didn’t give the runner a path to the plate, the runner would be ruled safe. It didn’t matter how far ahead of the runner that the ball arrived to the plate. In short, if teams weren’t going to get their catchers to position themselves correctly in compliance with the new rule, MLB was going to do it for them. And if you’re on the wrong end of one of these calls, you don’t like it. Just like White Sox manager Robin Ventura found himself in when umpires overturned a call in which the Giants’ Gregor Blanco was thrown out at the plate in the seventh inning on Tuesday. The play resulted in a 1-1 tie, and the Giants went on to score six more times in the inning en route to a 7-1 win. And Ventura was livid. Whoa! Whoa! Whoa! At what point did Ventura start to disagree with this rule. If you rewind back to Tuesday night’s game, Ventura found himself on the opposite end of a similar play. In the 10th inning, Chicago’s Jordan Danks were ruled out at the plate on a tag by Buster Posey. Ventura came out to have the play to review to see if Posey blocked Danks’ path to the plate, even though Danks was out by a longshot. One problem, however. 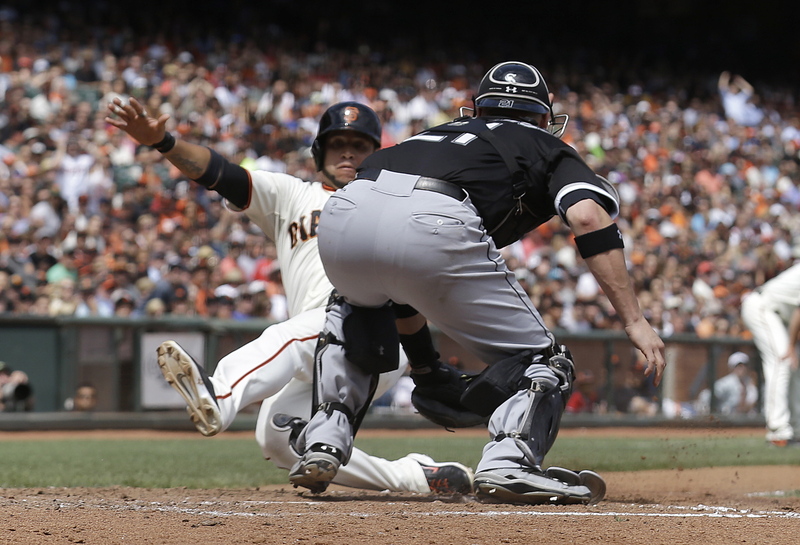 The review showed that Posey didn’t block the plate, that he did leave Danks a pathway to the plate. And why is this? Well, it’s because that’s how the Giants have taught their catchers to position themselves on plays on the plate. They instruct their catchers to get out IN FRONT OF home plate, between home plate and the pitchers mound, field the throw, then apply a sweep tag. That’s what Posey did. Now fast-forward to Wednesday afternoon. White Sox catcher Tyler Flowers did not get out in front of home plate. He stood right over it. And when he went to field the throw from first baseman Jose Abreu, Flowers left leg clearly blocked off the entire plate from the oncoming Blanco. Flowers even admitted this much, but said that’s not the point. Except it IS the point. Flowers was referring to the Scott Cousins play — I call it the Cousins play because the responsibility for that collision was completely on Cousins — that prematurely Posey’s season in May 2011. Here are three irrefutable points about the Cousins/Posey play. Posey was NOT blocking the plate on that play. Posey DID leave Cousins a lane to the plate. Cousins did believe he would be out by 30 feet. He felt that from where right fielder Nate Schierholtz was throwing the ball, Cousins would be out easily. His only recourse was to try to dislodge the ball from Posey. As it turned out, Posey got caught with a short hop that he didn’t handle cleanly. And that’s the point of the new rule. MLB wants catchers to leave runners a lane, so they don’t feel like their only course of action is collide with the catcher. And leaving a lane is all determined by where the catcher sets up to receive the throw. So here’s another question for Flowers. If Blanco was going to be out by a longshot, why was Flowers even blocking the plate in the first place? But it is realistic, if it’s a play that you have been trained on doing correctly. 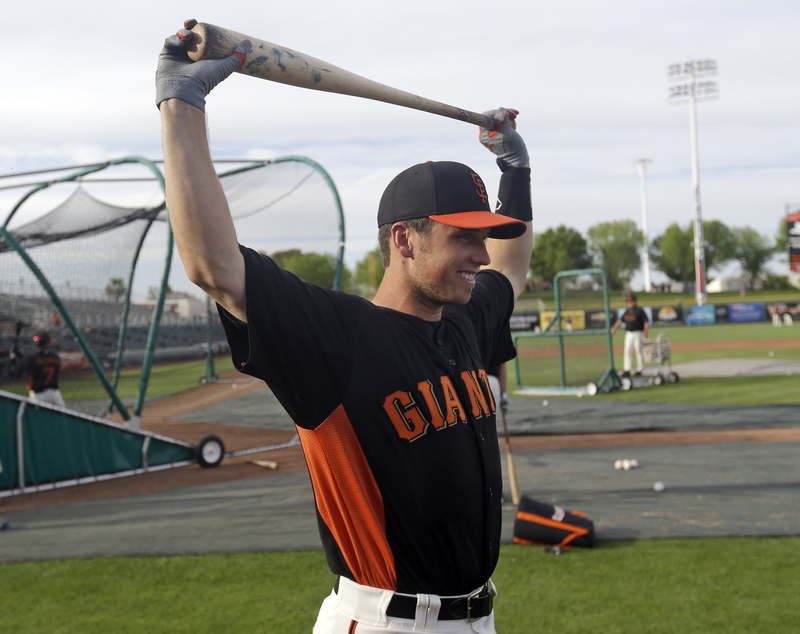 Buster Posey had time to do it correctly Tuesday night because he’s been trained to do that. Flowers, likely because the White Sox have not made it a priority, appeared as if he hasn’t been trained on this. So MLB gave him, and the White Sox, a valuable lesson. And they got what they deserved. And that’s not a technicality. Well, for the San Francisco Giants, significant injuries. At least that’s been true over the past few seasons. Mark DeRosa, Buster Posey, Pablo Sandoval, Ryan Vogelsong, Angel Pagan. All suffered significant injuries that cost them weeks of playing time in May. Wednesday’s injury may have been the most frustrating. In the top of the ninth, after he had just escaped a bases-loaded jam with the help of a double play ball, Santiago Casilla came to the plate for the first time since 2012. 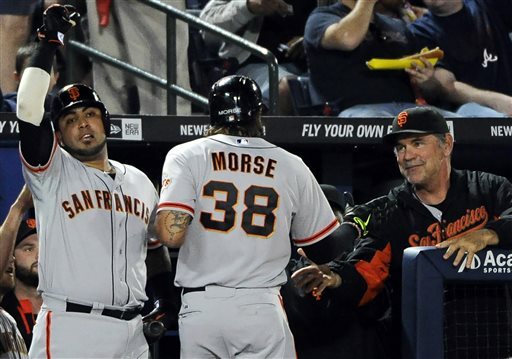 Manager Bruce Bochy said afterwards that he gave Casilla instructions not to swing. But Casilla went up there hacking, working the count full before hitting a chopper up the middle. Rockies shortstop Troy Tulowitzki charged the ball and threw to first. Casilla raced down the baseline with his hair on fire, as if they play were in Game 7 of the World Series. It was a game in May, and the Giants were leading 5-1. Just before he reached the bag, Casilla pulled up, then fell over the bag and began writhing in pain. Casilla suffered a hamstring injury so bad that he could not put wait on the leg and had to be helped off the field by two trainers. And this came after starter Matt Cain left the game early when he felt his hamstring tighten up. Casilla is definitely going on the DL. For how long, we won’t know until an MRI is performed Thursday. But it didn’t look good. By the looks of things, if the Giants get Casilla back before the All-Star break, they would be lucky. But it seems to follow a disturbing trend of key injuries suffered by Giants in the month of May. Mark DeRosa: Prior to the 2010 season, Mark DeRosa signed a two-year, $12 million deal to be a veteran presence in the lineup. But in May of 2010, DeRosa went on the DL with a wrist injury that ended his 2010 season after playing 26 games in 2010. He came back to play 47 games in 2011, mostly as a reserve. He also started a DL stint in May 2011. Edgar Renteria: Renteria went on the DL twice in May 2010, the first on May 7 with a strained groin. He returned May 22, played three games then went back on the DL with a strained hamstring for about a month. He would return, suffer other injuries, but return in the postseason to deliver one of the biggest hits in Giants history in Game 5 of the World Series. Buster Posey: The biggest May injury was Posey’s season-injury ankle injury on May 26 when he got plowed by Scott Cousins. Jeremy Affeldt: Affeldt went on the DL May 2 with a sprained knee sustained when his 4-year-old son lept into his arms after Affeldt returned home after a game. Now, granted, the injury occurred in late April, but Affeldt went on the DL in May. Affeldt missed the minimum, so it wasn’t major injury, but worth mentioning. Pablo Sandoval: Almost a year after breaking the hamate bone in his right hand, Sandoval breaks the hamate bone in his left hand, leaving a game early against the Marlins on May 2. He would be out until June 9. Santiago Casilla: This isn’t the first time Casilla visited the DL in May. Last season, he went on DL on May 21 with a cyst in his right knee and did not return from the DL until July 14. Ryan Vogelsong: Vogelsong was off to a bad start in 2013. But he looked to be turning things around with his best start of the season, throwing five shutout innings against the Nationals. Then he broke his hand swinging at a pitch at the plate. He would be out until Aug. 9. Angel Pagan: Pagan supplied perhaps the most exciting play of the 2013 season for the Giants when he won a game against the Rockies with a 10th-inning, inside-the-park home run. 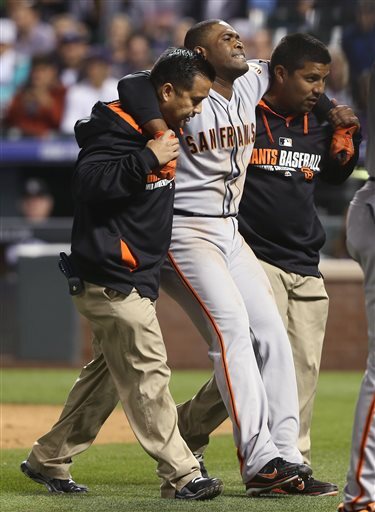 But Pagan hurt his hamstring on the play on May 25. They waited until June 7 to put him on the DL. He tried to return later in June, but aggravated the injury on June 20 playing for Class San Jose. He would later have surgery and be out until Aug. 30. Brandon Belt: Belt went on the DL after suffering a broken thumb when he was hit by a pitch from the Dodgers’ Paul Maholm on May 9. He’s not expected back until late June, at the earliest. Now, that was a tough way for a six-game winning streak to end. 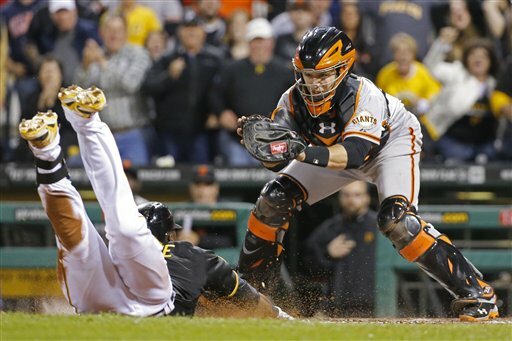 A two-out triple and error allowed Starling Marte to race around the bases and score the winning run in a 2-1 win for the Pittsburgh Pirates over the San Francisco Giants on Tuesday. To make matters worse, Marte was called out at the plate, but the call was reversed on replay — the first time that a game has been decided by a review reversal. You had to figure it would happen to Giants. There was a lot of conjecture and debate about the final play on talk radio and Twitter, as Giants fans were looking for someone to pin the blame on. HUNTER PENCE: Some fans said that Pence could have played the ball better off the wall in right. The ball bounced away from Pence after hitting the wall, allowing Marte to take third. I believe Pence misjudged the carry on this ball. When it came off Marte’s bat, I thought that Pence would catch the ball on the warning track. I think Pence thought the same thing, which put him in a bad spot to play the ball off the wall. So could he have played the ball better? Yes. But really it would have meant the difference between Marte at second or Marte at third. And with two out, a base hit is the most likely way Marte would have scored with two out. And a hit to the outfield scores Marte from second or third. TIM HUDSON: Other fans said that Hudson should have been in a better position to back up the throw to third. Again, OK, fine. But as a veteran pitcher, I don’t really think that Hudson thought there would be or should have been a throw into third. Is that an excuse? Not really. On a play like that, there’s no other place a pitcher should be than backing up a throw into third on a ball hit to right. But I’m not about to pin this one on Hudson, given the way he pitched when the Giants needed him to give the bullpen some much needed rest. PABLO SANDOVAL: Given his struggles at the plate, fans are just looking for a reason to make The Panda into The Goat. But not on this play. Fans said Sandoval should have done all he could to block the ball. But the throw was a bad one, forcing Sandoval to lunge for the ball. He actually did a great job to get up quickly, get to the ball and make a spot-on throw home. Sandoval was not at fault. BUSTER POSEY: This one drove me the most nuts. Fans were howling that Posey should have blocked Marte’s path to the plate. Some were blaming the new rule on blocking the plate, in which case they were wrong TWICE. For one, the new rule does not prevent a catcher from blocking the plate once he has the ball, and on this play, Posey had the ball early enough to block the plate within the rules. Secondly, regardless of the rule and what it allows, the Giants have instructed Posey for more than two years to avoid contact at the plate. Even if it means allowing a run — even the winning run — to score, they would much rather have a healthy Posey. And that’s the right call. Other fans thought Posey should have made a better tag, placing the tag on the hand or arm and not on the body. Well, looking at the replay, Posey did attempt to tag Marte on his left hand or arm, but Marte alerted pulled that hand back to his body to avoid the tag, leaving Posey to tag his chest. That allowed Marte to slip his right hand onto the plate. If there was a way to fault Posey, it was his positioning at the plate. When Posey took the throw, he was standing right over home plate. When Marte came in with his slide, Posey backed away from him to avoid contact, applying the tag in a matador-like style. Again, this is likely a by-product of the Giants telling him to avoid contact. But a better way of that to happen is for Posey to position himself in fair territory and up the line to third to shorten the length of the thrown from Sandoval. This would have given Marte a lane to the plate, as the rule stipulates, but would have allowed Posey to make the tag earlier. The only question here is whether Posey could have done that and still retained a line of sight from Sandoval. THE UMPIRES: Other fans were screaming that they hate replay. But I can assure you, that if the replay had allowed the Giants to win, they would love it. Replay is here to make sure calls are correct. As Jon Miller said in the post-game, in the entire history of the game, that play would have been called out because the throw beat Marte to the plate. It wouldn’t have mattered where the tag was, unless Marte made a more obvious attempt to avoid the tag. But now, with replay, it matters where the tag is. And that’s the way it should be. The Giants were saying afterward they thought the replay was inconclusive and should not have been overturned. That’s more their hearts talking. The Giants had a play reviewed earlier this season ruled inconclusive that the Giants felt clearly showed that the call on the field should have been overturned. But that was in the first couple of weeks of the season, when the replay ump was far more reluctant to overturn calls on the field. But now they are willing to make the closer calls on replay. And in this case, the replay showed he was safe. EHIRE ADRIANZA: If you were looking for the real culprit, you should look no further than Adrianza. This was another case of situational baseball, much like the plays earlier this season by Sandoval when he charged a slow roller and made an ill-advised and errant throw to first, allowing a run to score. The best play here would have been to eat the ball. The situation would have been different had their been one out or no outs. A runner at third with less than two outs is a much different situation. It’s a risk vs. reward situation, and the reward goes up with less than two outs. But with two outs, you don’t need to be a hero. You need to trust your pitcher to get that third out. There really wasn’t a play on Marte at third, and the risk of something bad happening outweighed the reward. If chick dig the long ball, they love the 2014 San Francisco Giants. The Giants smacked three more home runs as they beat the Atlanta Braves 3-1 on Saturday in Atlanta. That makes five solo home runs in the first two games of the series so far, accounting for all five of the Giants’ runs. But the string of home runs accounting for the Giants’ offense on the road goes back further than that. Going back to the Giants’ previous road trip in Colorado, the last 18 runs the Giants have scored on the road were accounted for by home runs — 12 of them. Home runs have also accounted for 24 of the last 28 runs the Giants have scored on the road, and 29 of the last 34 runs they’ve scored on the road, dating all the way back to April 5. During that span, only one play has a run-scoring hit that was not a home run: Angel Pagan (a two-run single on April 20 in San Diego, and an RBI double on April 5 in L.A.). The San Francisco Giants are 2-0 after the All-Star break. We knew the series against the Diamondbacks was going to be big. And these two games had the feel of October baseball. In fact, Saturday’s 4-3 win by the Giants over Arizona felt a lot like Game 5 of last October’s NL Division Series against the Reds. 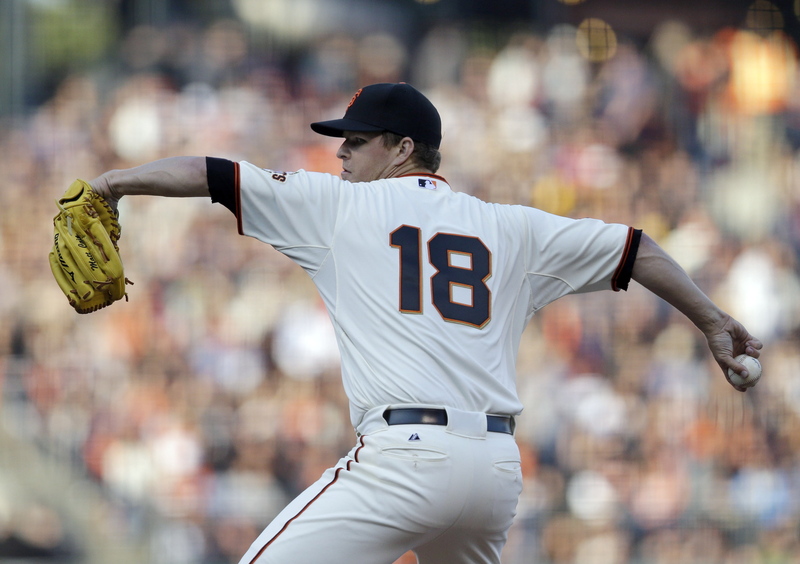 Matt Cain gets the start, pitches well early, is given the lead, but can’t get through the sixth inning. Buster Posey hits a big home run in the fifth inning to extend the Giants’ lead, and the homer represents the last of the Giants’ scoring. The bullpen runs the gauntlet in the late innings, escaping jam after jam and hanging onto the lead. Sergio Romo gives up a one run in the ninth, but locks down the victory. CAIN’S START: After an ugly outing in St. Louis on June 1, Cain posted a 1.84 ERA over his next five starts, lowering his ERA from 5.45 to 4.29. Then he had two ugly starts vs. the Dodgers (2.1 IP, 8 ER) and Mets (0.2 IP, 3 ER) and his ERA was back at 5.06. Cain came out Saturday and threw up four zeros before getting charged for single earned runs in the fifth and sixth. He should have escaped with another zero in the fifth when he got Eric Chavez to hit a double-play ball to second. But shortstop Tony Abreu, playing in place of the mildly hurt Brandon Crawford, threw the throw to first away, allowing a run to score. At the time, the run was unearned, as it scored on an error. But when Cain followed with back-to-back walks, it turned the run into an earned run. But if Abreu makes the play he should have, no runs score. He opened the sixth by giving up back-to-back singles and exited with 102 pitches in five-plus innings. Again, the Abreu error in the fifth led to Cain throwing an extra 15-18 pitches in the fifth. AFFELDT HURT: Last October in Cincinnati, Affeldt suffered a minor injury when he tried to avoid a foul ball in the dugout. Saturday’s injury was a bit more severe. Affeldt suffered a strain groin and is likely headed to the DL. It’s quite possible Affeldt may be out a month. Jean Machi likely will get recalled to fill Affeldt’s spot, but when does Dan Runzler get another shot in the bigs? He’s a lefty, even though the Giants have lefties Javier Lopez and Jose Mijares in the pen. BUSTER’S BLAST: After Andres Torres singled with one out in the fifth, Buster Posey blasted a shot over the center-field wall for his 14th homer of the year. It gave the Giants a 4-1 lead. BULLPEN STARTS, THEN PUTS OUT FIRES: After Cain got the hook with two on and no outs in the sixth, George Kontos gave up an RBI single to Martin Prado to make it 4-2, then got Cody Ross to line out to second for the first out. Affeldt was brought in for Kontos and got Cliff Pennington to fly out to Pence in Triple’s Alley. But then strained his groin on a 2-2 pitch to A.J. Pollock and Jose Mijares was called in. Mijares walked Pollock to load the bases, but struck out Adam Eaton to end the threat. In the seventh, and Santiago Casilla pitching, Aaron Hill got a two-out walk followed by a single by Miguel Montero. So again, go-ahead run came to the plate. But Castilla got Martin Prado to ground out. In the eight, Sandy Rosario came into pitch and gave up a lead-off single to Cody Ross that glanced off Rosario’s ring finger on his pitching hand (X-rays after the game were negative). After Rosario got Pennington to fly to center, Javier Lopez came in. Wil Nieves reached on an error by Crawford, again bringing the go-ahead run to the plate. But Eaton made the second out on a comebacker to Lopez and Gerardo Parra grounded to second to end the inning. In the ninth, Sergio Romo came in and gave up an infield single to Paul Goldschmidt off Romo’s glove. Hill flied to center, and Montero grounded to first with Goldschmidt taking second. Prado hit a bloop single to right to score Goldschmidt, but Romo struck out Cody Ross to end the game. Now, the Giants clinched the series win they needed to get. They are 4.5 game out of first place, four games behind the second-place Dodgers. A win tomorrow will get them at least within four games of the lead, maybe 3.5. This is an opportunity with All-Star Madison Bumgarner on the mound. The Giants need to seize on these opportunities. And it would be nice if they could do without going too deep into the bullpen that used seven of eight pitchers in the pen on Saturday. The San Francisco Giants are 39-43. They are 10-18 since June 1. They’ve lost seven of their last eight games, nine of their last 11, 12 of their last 16. Has the June swoon, which continued into July with an 8-1 rain-shortened loss to the Reds on Monday, cooled the fervor of Giants’ fans from getting out the vote for the NL All-Star game? Last season, a late push of online votes propelled Buster Posey, Melky Cabrera and Pablo Sandoval into All-Star starters. Posey set an all-time record for all-star votes with more than 7 million votes. In voting results released Tuesday, the Cardinals’ Yadier Molina continues to be the NL’s leading vote-getter with 5,093,645 votes. Posey is No. 2 at the catching position, more than 300,000 votes behind Molina. Posey is the No. 3 overall NL vote-getter — outfielder Carlos Beltran has 5.013 million votes. All-Star voting ends on Thursday. Again, no Giant leads his position in All-Star voting. David Wright of the Mets extended his lead over Pablo Sandoval at third base to 842,000 votes. In fact, the Giants player who is closest to the top vote-getter at his position is Marco Scutaro, who trails the Reds’ Brandon Phillips by less than 300,000 votes. However, Scutaro is in third at second base, as the Cardinals’ Matt Carpenter is in second, 44,000 votes ahead of Scutaro. Brandon Crawford continues to be No. 2 among shortstops, but trails leader Troy Tulowitzki of the Rockies by almost 1.7 million votes. First baseman Brandon Belt is fourth at his position. Hunter Pence is 7th among outfielders, while Angel Pagan is 9th and Gregor Blanco is 13th. Friday night started in rocking fashion with members of the band Metallica performing the National Anthem. Afterall, it was Metallica Night. 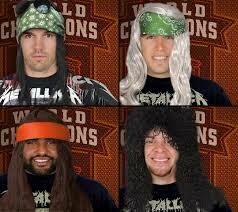 The Giants helped celebrate the night by mocking up Giants players as hard rockers on the stadium scoreboard. Then it was Buster Posey delivering the final encore by leading off the bottom of the ninth with a solo home run over the left-field fence for a 2-1 victory over the hated Dodgers. The walk-off home run was the first in the career of Buster Posey. In fact, it was his first walk-off hit of any kind. The home run came off Ronald Belisario, who Posey had gone 0 for 6 with five strikeouts before Friday’s blast. The Giants won despite another shutdown performance against them by Clayton Kershaw. Kershaw took a no-hitter into the sixth inning. The Dodgers scored one run on 11 hits and SEVEN walks. They stranded 13 and hit into three double plays. The Dodgers lost despite putting the leadoff runner on base in the first, second, third, fourth, fifth, sixth and eighth innings. They put runners on first and second with no outs in the second and third, and didn’t score either time. That run was the first allowed at home this season by Barry Zito. His ERA at home this season sits at 0.35. The Dodgers’ lone run probably should have been prevented. With Kershaw on third and one out in the fifth, Nick Punto grounded into the hole at short. Joaquin Arias’ best play would have been to simply stop the ball and prevent Kershaw from scoring. Instead, he tried to glove the ball with a slide in an effort to get off a throw to first and ended up missing the ball. It went for an RBI single. The next batter, Matt Kemp, grounded into an inning-ending double play. It was the seventh time that the Giants have hit a game-tying or go-ahead home run in the eighth inning or later this season. They’ve only hit 22 home runs all season, fourth fewest in the NL (The Dodgers have the second fewest with 20; apparently money doesn’t buy home runs, either). To add injury to insult for the Dodgers, Hanley Ramirez, who just made his season-debut earlier this week after a stint on the DL, went back on the DL Saturday morning after pulling his hamstring trying to from first to third on a single. Hunter Pence threw him out. 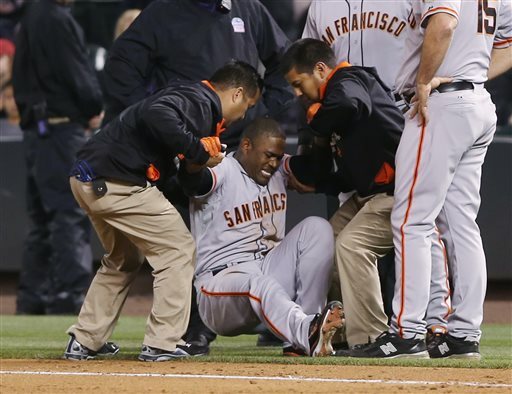 That was the second consecutive game at AT&T Park that Ramirez had to exit early because of an injury. The previous game came in the World Baesball Classic.